Half of IDP households in Ukraine are families with children. In its report National Monitoring System on Situation of IDPs in Ukraine, the International Organization for Migration (IOM), reveals that on average, income per internally displaced person (IDP) in Ukraine is 1,991 Ukrainian Hryvnia – or $75 per month, approximately $2.50 per day. While a loaf of bread costing about 0.40, some 21 per cent are surviving on less than $2 a day. “Lack of support in finding relevant solutions for IDPs and returnees hinders their integration and creates dependencies on government and aid organizations,” said IOM Ukraine Chief of Mission, Manfred Profazi, in a press statement. As of April, Ukraine’s Ministry of Social Policy has registered some 1.5 million IDPs since 2014. Since the beginning of the crisis in Ukraine, IOM has provided support to some 138,000 conflict-affected people. Its current focus lies in providing income opportunities for IDPs and conflict-affected populations, and facilitating social cohesion, recovery and peacebuilding. On a positive note, the level of employed IDPs has increased slightly, from 35 per cent in March 2016, when the first IOM survey was conducted, to 42 per cent currently. However, when compared to the situation before displacement, employment levels remain quite low – approximately one third of those working before the conflict remain unable find a new job. Other problematic issues are living conditions and payment for rent and utilities. Two thirds of IDPs dwell in rented housing, while one fifth stay with relatives or host families. Only one per cent of people in the Government-controlled part of Ukraine live in their own home. The survey shows great uncertainty about the future. A quarter of IDPs say they will never move back to their places of origin. Thirty-nine per cent would like to return when the conflict is over. Another 17 per cent said that they may consider returning in the future. At the joint presentation of the survey in Kyiv, Deputy Minister of Temporarily Occupied Territories and IDPs, Heorhii Tuka, stressed the importance of data collection and IOM’s expertise in shaping strategy and planning practical steps to support the well-being and integration of IDPs. 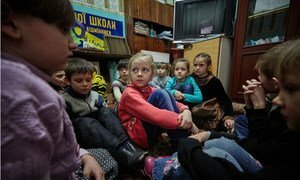 More than 200,000 children, or one in four, in the two regions most severely affected by the ongoing conflict in eastern Ukraine require urgent and sustained psychosocial support to address their traumatic experiences, the United Nations Children's Fund (UNICEF) said today.